Make a Google Account with Simple Steps | Gmail Tutorial | Computer Tips | HowTech.info –Tutorials! Reviews! News! ‘Google Accent’ or ‘Gmail‘is an Online Internet account in which emails are saved on the Website of Google rather than on your computer or mobile. Web email can be a flexible solution as you can access e-mails from any pc/ mobile that has internet access – for example, at inter-net cafés – anyplace in the entire world. Step By Step Create Google Account. Open Your Browser and Type Google.com or Directly Go to Gmail.com. Now google.com Site will be open. See right Corner in the menu and pick Gmail. Now click on the “new Google Account" Link. A new web page of Google's "Create your Google Account" will be Open. Now fill your Full Detail on Box such as first Name, Last Name. Choose Your User Name What name you want to User name Fill if your username not available then you can select any other, choice given by Google. Now Fill your Password and conform again. Please Not Create Password and Conform Password Should Be Mach, I mean to say fill same password on Both Box. Now Select your Date of Birth from Dropdown Menu. Select Gender from Drop down Menu like Male or Female. Fill your Mobile No with Country Code. Fill your Current Email ID. Now Fill Ceptcha as shown letter or Numbers. If you are filling wrong captcha or you do not understand Ceptcha then you can refresh ceptccha. Then you can see other Ceptcha word. And Last TaskTick Mark on me agrees to the Google Terms & Service. Click next Step and Congratulation Massage will be showing in your Gmail Account Now you can Send Mail .Gmail account is fast and simple, and also offers you access to other Google products and solutions like as YouTube.com, Google-Drive, and Google-Plugin this details, I am going to show you how to get started with email by creating a Gmail account. 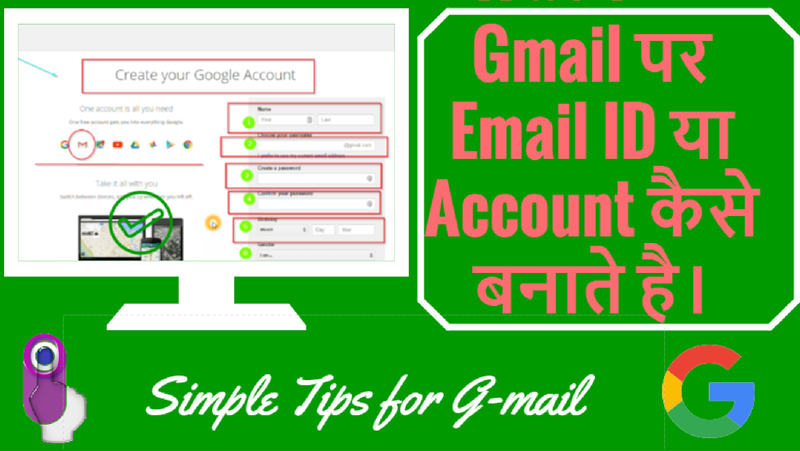 Free Watch Full Video Tutorial Learn & Create Your Google Gmail Account with Easy Steps. 57 comments to ''Make a Google Account with Simple Steps | Gmail Tutorial | Computer Tips"
aha! i make Gmail now you can send Emails. This is why you see some people with really old looking computers, but under the shell they have some pretty neat Computer Parts, so their computer is running faster than your brand spanking new one, which can confuse a lot of people. This bit of blog shows commitment of author. Wow Very Nice Information Thanks For Sharing It. This blog is precisely what I was searching for. you have got a excellent blog here! do you need to develop invite posts on my small blog? LOL! I recently found a problem in your post! Find out if your theme is positioned properly! hi!,I like your writing very much! share we communicate a lot more about your post on AOL? I require a specialist on this area to solve my problem. Maybe that’s you! Looking forward to see you. Best Computer Repair They will then guide you and ask you about the kind of service you want; on site or off site. An onsite service means that the device will be fixed on the spot and offsite means that it could be taken to the company where a detailed analysis will be done. At you have the capacity should transfer interesting, interesting web substance Also deal with to get general movement should your website that point you might anticipate will acquire around? 5 or? 12 An day from your allowed website, which isn't altogether terrible setting off for minimal exertion. Sometime few educational blogs become very helpful while getting relevant and new information related to your targeted area. As I found this blog and appreciate the information delivered to my database. Professionally written blogs are rare to find, however I appreciate all the points mentioned here. I also want to include some other writing skills which everyone must aware of. Enthusiastic words written in this blog helped me to enhance my skills as well as helped me to know how I can help myself on my own. I am really glad to come at this platform. Mesmerized article written on this blog with other relevant information. It is straight to the point that how we can improve our skills as well as how we can be represented to a new stream of professionalism. Now day, everything is going to find a new but well settled and successful stream for their career. When I came to this blog, I really impressed by all the knowledge points mentioned here. Thank you for this assistance. I am thankful to this blog for assisting me. I added some specified clues which are really important for me to use them in my writing skill. Really helpful stuff made by this blog. Most of educational information over different kinds of blogs do not such supportive as supportive all the points of this blog. You need not to find any other platform to verify the data stated here. A writer should always try to keep its writing very simple and clear. Always use facts which are easily acceptable by general people because they are very close to their assumptions and they welcome such kind of facts. Actually, I am facing some difficulties to understand the meaning of the blog. If you have any short video film related to your blog, then I would request you to share here. It would be great help. I found this blog after a long time which is really helpful to let understand different approaches. I am going to adopt these new point to my career and thankful for this help. Share great information about your blog , Blog really helpful for us . We read your blog , share most useful information in blog . Thanks for share your blog here . This blog is really helpful to deliver updated educational affairs over internet which is really appraisable. I found one successful example of this truth through this blog. I am going to use such information now. I am grateful for this blog to distribute knowledge about this significant topic. Here I found different segments and now I am going to use these new instructions with new enthusiasm. I enjoyed reading this blog. in my opinion, everything was perfectly written there as well as few small tips are also can be taken as healthy suggestion. Descriptive informative content written in this blog is very useful. I found a lot of interesting information here.